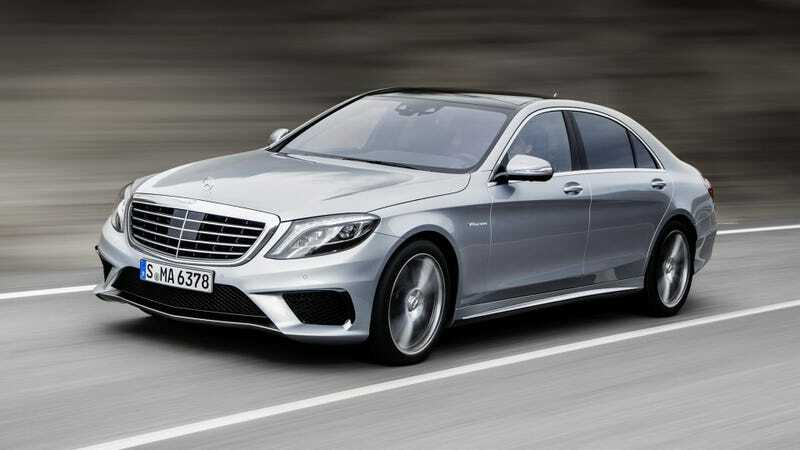 Being 220 pounds lighter than the previous S 63 AMG, Mercedes-Benz's newest beefed up S-Class will reach 60 mph in 4 seconds thanks to the 577 horsepower and 664 ft·lb coming from the 5.5-liter AMG V8 biturbo up front. The S 63 uses forged light-alloy wheels, a lightweight lithium-ion battery and a composite brake system in order to be less of a whale than the regular 2014 S-Class, though it still weighs 4,398 pounds. While the top speed is once again limited to 155 mph, the acceleration is mind blowing at 4.4 seconds, or 4.0 with the 4-MATIC all-wheel drive system that future AMG cars will also use instead of the constant tire slaying we all love them for. Mercedes is also promising 22 mpg, not that you have to care about that if you buy a car like this. How Many Horses Can You Cram Into A Mercedes E63 AMG? Oh. THOSE horses. Never mind. The hand-built 5.5-liter AMG engine is the real selling point here. It has direct injection, two turbos connected to an air-to-water intercooler, an aluminum crankcase, four valves per cylinder with camshaft adjustment and a composite oil pan. 577 horsepower and 664 ft·lb. Put the car in sport or manual, and you can hear it too thanks to the exhaust flaps opening earlier in both rear silencers. On the inside, it's still pretty much like having your own private jet. The S 63 comes with AMG sport seats, more embossed emblems and brushed stainless steel pieces all around, and an analogue clock with three-dimensional, milled metal hands and metal appliqués on the dial. You can also have a folding table in the back, not to mention the massage and "warmth" packages. Sounds like a good time. The seven-speed automatic is the same as before while the sports suspension is based on what they call "Magic Body Control." The magic part is done by a stereo camera that scans the road surface ahead and adjust the car before you get there. That's only available with the rear-wheel drive chassis, while all-wheel drive can only come with the long-wheelbase body. Debuting in September at the Frankfurt International Motor Show, we will see just how magical it is.